A branch of Fultons Foods in Bramley, Leeds. 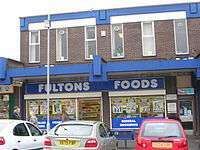 Fulton's Foods is a frozen food retailer chain, which is based in Darton, South Yorkshire, and operates throughout The Midlands and the North of England. The company was founded by Jack Fulton in 1960 as a poultry business. It diversified into frozen foods in 1974, using the company name Frozen Value Ltd. In August 1997, it was then subject to a management buy-in, financed by 3i Group, when Kevin Gunter took control of the business. In October 2005, it opened a 70,000 sq ft (6,500 m2) depot in Darton, South Yorkshire. and in March 2013, the company was rebranded Fulton's Foods. The founder, Jack Fulton, died on 29 September 2015. ↑ "Castleford Tigers chairman Jack Fulton dies". Yorkshire Evening Post. 29 September 2015. Retrieved 29 September 2015.